Fuser drive gear kit for the HP LaserJet P3005, M3027, or M3035 series printers. If you have replaced the P3005 fuser and your printer sounds different (you hear rumbling or noisy gear sounds) you should replace these gears. 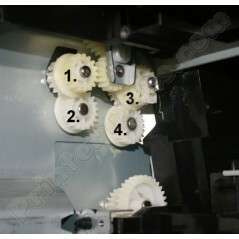 This kit contains four (#1-4 pictured) drive gears, they sit at the back of the printer behind the fuser. These gears commonly wear out on the P3005 , M3027 , M3035 series printers.